Arjun and Malaika partied hard at Sanjay Kapoor's residence. Bollywood celebrities partied hard and welcomed 2019 with open hearts. Well, we saw many jodis in 2018 one among them is of Malaika Arora and Arjun Kapoor. Both the stars never made their relationship official but their actions prove that there is more than just friendship between them. 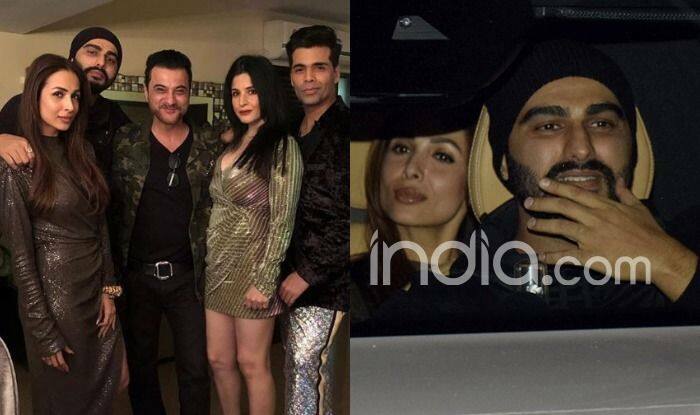 Malaika and Arjun together attended Sanjay Kapoor’s New Year bash. It seems like now they are in no mood to hide things as they arrived together at the party. The lady looked drop dead gorgeous in a shimmery high-slit gown. Arjun was seen in the casual avatar. Harshvardhan Kapoor was spotted in the causal avatar. He was all smiles for shutterbugs. Punit Malhotra, Chunky Pandey and many other celebrities were spotted at Sanjay’s residence. Sonam Kapoor and Rhea Kapoor gave it a miss as they celebrated the evening in a different city. A day before the New Year, Malaika was spotted outside Arjun’s house. From their frequent joint appearances to adorable comments on each other’s post, people are waiting for both the stars to make their relationship official. Reports were doing the rounds that they are planning to tie the knot this year. However, whenever asked, they always refused to comment on the same. Recently, Arjun graced Koffee With Karan and stated that he is not single and also has marriage plans. This added fuel to the fire. On a related note, the actor is occupied with the work of his upcoming film, Panipat. The movie also features Sanjay Dutt. He was last seen in Namaste England with Parineeti Chopra. The film couldn’t do wonders at the box office.